Another date added to the UK Tour with The Imposters. Not at The Sage in Gateshead this time, but across the Tyne at Newcastle City Hall. Elvis last played there (with The Imposters) in 2002. Watched Elvis and the Attractions many times at the City hall, my first show was March 22nd 1978, 40 years ago this week and was hooked. May try and go see my mum and get to attend this one for old times sake! I wonder what's gonna hapoen cos it's the England match. Elvis loves his footie - and so do Newcastle! Which England match would that be? The one that was played on Sunday 24th or is there another one on today? Oh yeah - I got my gigs mixed up. I meant the Plymouth gig! In answer we to Neil, yes to both - on the train now to Newcastle ! After a pretty dynamic gig with lots of variations in the set list , Elvis seemed to have got a slight creak in his voice , apparent on Shipbuilding and also slightly in Alison but not so much in the finale of PLU and PIU but when we met him backstage he was only speaking in a whisper and looks tired and drawn - just hoping a day off will revitalise his voice for Southend and Plymouth - don’t let my hometown gig get cancelled !! The audience was more responsive than Edinburgh and Elvis said he’d always enjoyed playing in Newcastle and that sometimes he said a flip comment but that this time he really meant it. The opening salvo was changed to Wonder Woman, Mystery Dance and a stunning Clubland ( Elvis says he’d stolen this from Stung, no doubt a reference to a local boy and the chord sequence of Message In A Bottle) but Clubland has the most sophisticated of lyrics - a long time personal favourite ! Steve also stood out in Talking On The Dark and Elvis and the girls did a slow, slow grind on I Can’t Stand Up turning it into a chilling power ballad - and please may I keep Briana Lee so she can sing to me whenever I want her too - Kitten is amazing but Briana’ s husky low notes give me goosebumps . So a bit of a worry with Elvis and a bit of an anxious time ahead - just hope and pray he gets the rest he needs - however long that takes and no matter what he may or may not need to cancel ! 12. I Want You - I Say A Littke Prayer For You - other snippet ? sulky lad wrote: 12. I Want You - I Say A Littke Prayer For You - other snippet ? The other snippet is Ray Charles' "I Believe To My Soul." Ok, ANCT - how on earth did you know this - you truly are omnipotent !! I’m so impressed ! And of course, you’re right ! My excuse is, it’s easier to upload a quick clip from a phone than to edit one complete wav file fir a concert but the cancellations mean Cardiff, Edinburgh and Newcastle should be up on a certain currency website by the weekend ! Thanks for the EC snippet of RC 'IBTMS'. Posted my recording of this show on a certain torrent site and received a cryptic comment from Toasttoast - anyone any idea if this is Chris keeping an eye on the 40 year anniversary uploads and any other EC live material that may be in circulation ? sulky lad wrote: received a cryptic comment from Toasttoast - anyone any idea if this is Chris ? Think that is an imposter! Toasttoast's profile is showing as a USA national - our pal "Toast" gives his 'place' as Liverpool in his Twitter profile. BTW I have no idea what Toasttoast's comment related to - I'd describe as incoherent rather than cryptic! Last edited by Top balcony on Sun Jul 15, 2018 7:44 am, edited 1 time in total. A review by Philip Tallentire published in the Teesside Gazette on 26 June, 2018. Elvis Costello is one of the greatest singer-songwriters this nation has produced. His career stretches back more than 40 years to a time when he was an angry young man of the English new wave and, by his own admission, his contemporaries were “The Jags and The Vapors”. Costello’s deliberately nerdy image featured horn rimmed glasses and a suit and it’s a dress code that he still follows at the age of 63, even when a concert is taking place on a hot North-east night! His latest tour precedes the anticipated release of new album but, for his gig at Newcastle City Hall, he dipped into his magical back catalogue time and time again. It should be said time has taken its toll on his unmistakable voice, the range simply ain’t what it used to be. But that didn’t stop Costello putting on a memorable two hour show. Backed by a band that included two thirds of the Attractions – drummer Pete Thomas and pianist Steve Nieve – the sound was predictably brilliant. And the addition of outstanding backing singers Kitten Kuroi and Briana Lee was the icing on the cake. They offered a new dimension to many of the more familiar tracks and added femininity to Costello’s testosterone-fuelled lyrics. With such a huge and varied songbook, it was always going to be a question of what he didn’t play rather than what he did. The good news for his fans in attendance is he pulled out most of his plum tracks. And the pace was frantic at times, more in keeping with a sweaty punk club of the 1970s than the sober surroundings of the City Hall. Mystery Dance and Clubland, a song Costello said he “stole from Sting” were performed with a ferocity that a teen garage band would struggle to match. The same could be said of (I Don’t Want To Go To) Chelsea which featured Thomas’s legendary drum fills. But, if anything, the slow numbers worked best on the night. Tears Before Bedtime from the 1978 album This Year’s Model was delivered magnificently and it was wonderful to hear the sinister Beyond Belief. The main set ended with the 1986 tour de force I Want You from Blood and Chocolate. Costello squeezed out every last drop of emotion from a song that had the audience transfixed. After a brief break, Costello returned to the stage wearing a magnificent red hat and striped jacket to perform a ragged version of Alison. That was followed by a gospel version of I Can’t Stand Up and, accompanied by Nieve on piano, Talking In The Dark. The full band then ripped through Oliver’s Army, with a big cheer greeting the infamous line ‘The boys from the Mersey and the Thames and the (big pause) Tyne’. Shipbuilding, an anti-war song that could easily have been written with the North-east in mind, was simply spine-tingling and the night ended on a high with full-blooded runs through of (What’s So Funny ‘Bout) Peace Love And Understanding? and Pump It Up." Given the subsequent cancellation of other dates on the European Tour, it is interesting to note the comment that "time has taken its toll on his unmistakable voice". As it transpired, it was not time, but the surgery that had this effect, but no way the reviewer could have known this ahead of Elvis' announcement a few days later. A review by Adam Kennedy posted at National Rock Reviews, which is a new website to me, but seems to have a fair amount of recent content. I guess it is a reaction to journalists and photographers no longer having a printed outlet for their work. 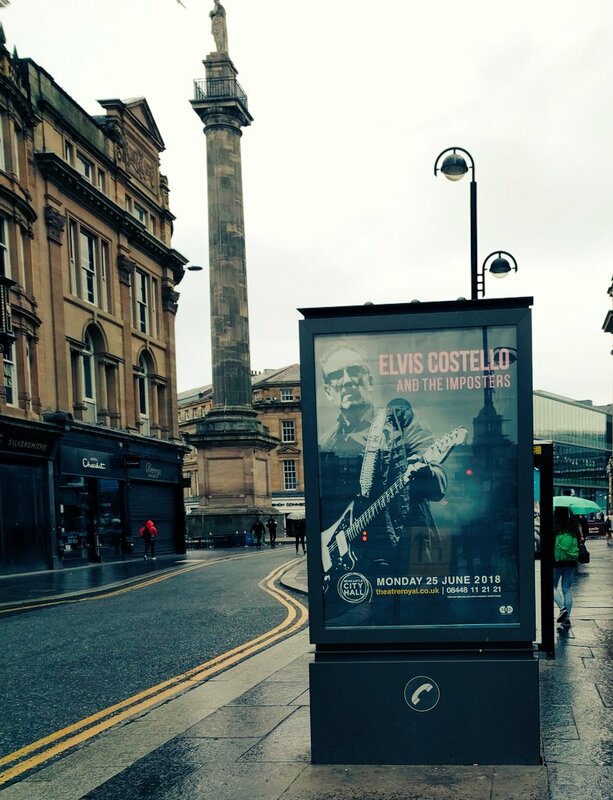 Elvis Costello and the Imposters turn back the clocks at the Newcastle City Hall. Last year marked the 40th anniversary of the release of Elvis Costello’s debut album My Aim Is True, and subsequently, the New Wave legend is out on the road in celebration of this landmark in his career. During this evening’s two hour musical marathon, Elvis Costello delivers a set that perfectly represents his vast songbook including many of his greatest hits as well reworkings of some of his classic cuts. Costello is joined onstage throughout by his five-piece band featuring Steve Nieve (piano/keys), Pete Thomas (drums), Davey Faragher (bass) and backing vocalists Kitten Kurio and Briana Lee. This incredibly talented band comes together seamlessly all night long. Costello kicks off the show with his Allen Toussaint collaboration “Wonder Woman”, before commencing a walk down memory lane with “Mystery Dance” and “Clubland”, which in turn sets the tone for the night ahead. The pace is slowed down somewhat with a beautiful airing of “Tears Before Bedtime” during which Kurio and Lee deliver some soulful vocal harmonies. A run of 70’s smash hits including the groove-heavy “(I Don’t Want To Go To) Chelsea”, the frantic “Lipstick Vogue” and his reggae-tinged single “Watching The Detectives” certainly pleases the Newcastle faithful. The latter of which features some blistering and passionate fretwork from Costello. Positioned by the piano and accompanied by Steve Nieve the pair delivers a spellbinding airing of “You Shouldn’t Look At Me That Way”. This track is enough to make those in attendance feel as though they are sat in an old-school New York jazz club rather than the Newcastle City Hall. This astounding composition originally featured on the soundtrack to the movie Film Stars Don’t Die In Liverpool. After a brief interlude, Elvis Costello reappears onstage alongside Kurio and Lee whereby they deliver a harmonious version of “Alison”. Several stunning piano based numbers follow including “I Can’t Stand up” which features the piano playing of the man himself before Steve Nieve picks up the reigns for, “Talking In The Dark” and the classic “Accidents Will Happen”. Just like a fine wine Costello’s dynamic voice just keeps on getting better with age. There seems to be some debate amongst Elvis Costello fans regarding the song “She”. Of course, the track featured on the soundtrack to the 90’s hit movie Notting Hill. It appears that whilst some fans love the song, others not so much. Subsequently, Costello tosses a coin each night to decide whether to include the song in the set or not. Tonight heads wins and a beautiful heartfelt delivery of the track follows thus pleasing many in the crowd. As Elvis Costello hurtles towards the end of his career spanning set, he wheels out several back to back crowd-pleasing numbers including an emphatic rendition of “Oliver’s Army”, an epic performance of “Shipbuilding”, the thunderous “(What’s So Funny ‘Bout) Peace, Love and Understanding” before bringing the night full circle with his timeless anthem “Pump It Up”. The whole room up on their feet whilst singing wholeheartedly word for word. With a career spanning over forty years Elvis Costello continues to go from strength to strength and is showing no signs of slowing down." There is a good set of ten concert photos by Adam Kennedy if you click on the link above.